Whoa, is That a Nikon? B. Thomas (Arlington, Texas, United States) on 11 September 2012 in Animal & Insect. Hey, is that a Nikon you're using? Starting yet another moose series. Hope you are not tired of moose. Nope not yet. :) Clever addition for Silly Tuesday. Better than being shot with a Canon! What a look of surprise on this guy's face! :-) Superb !! 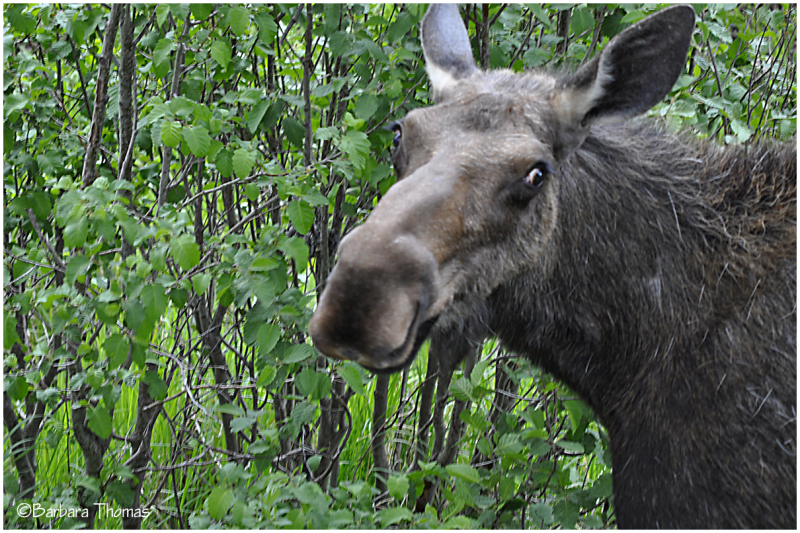 I ave never seen any moose so you can post such portraits as you want ! Happy Silly Tuesday ! Ha ha - I just love how silly they look! I don't guess they're very scared or timid around people, eh? @Jason Politte: As long as we are quiet and don't get too close, they are pretty calm, but can also be dangerous. You caught a fine wide-eyed look that is instantly captivating to the viewer. Excellent ST shot. Un sacré coup d'oeil ! Who "kon" resist them there eyes! Yukon with a Nikon that's "moo." Thanks for the big grin ;) Super ! Happy ST! Love the expression. I love your moose images! Must have good taste if he knows a Nikon when he sees one. Happy silly Tuesday. Wow, how did you capture that? A great look for ST! Great capture. Love that look. Hang it on the wall. By the look in those eyes...I'd have packed my kit and all and disappeared into the trees. What a look! Great one! Very funny...great shot :) makes me laugh. Nice portrait Barbara, and so rare. How could I get tired of that? Looking forward to the series.